I created this Skull & Flower lesson in mixed media as a guest teacher for Kara Bullock’s 2016 Creatures Among Us course. In this lesson, I will share with you my process of layering patterned papers and using acrylic paints to create the background, skull and flower. This piece was inspired by Georgia O’Keefe as well as my love for the southwest. According to the O’Keefe Museum in Santa Fe, New Mexico, “Georgia O’Keeffe is one of the most significant and intriguing artists of the twentieth century, known internationally for her boldly innovative art. Her distinct flowers, dramatic cityscapes, glowing landscapes, and images of bones against the stark desert sky are iconic and original contributions to American Modernism”. 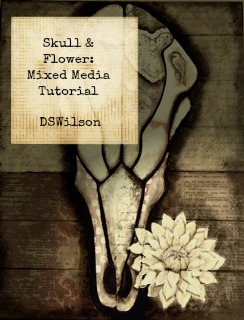 In this lesson, you will recieve 90 minutes of online video instruction, supply list, skull template and flower template. You can use the templates, or create your own. **Once you have purchased your class, you will receive the password via email within 24-48 hours. This password will unlock the classroom for you as well as the videos. I am also available to you for any questions, comments, feedback, assistance or sharing. I would love to see what you create!